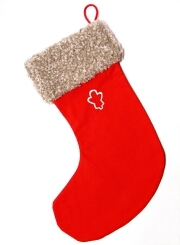 The tradition of hanging Christmas stockings began with a story in ancient days about a kind man who had three daughters. In those days a dowry or money had to be given before a girl could marry. When these girls fell in love and wanted to marry, the poor father could not afford their dowries. A teenage boy named Nickolas (who later the Church made Saint Nickolas) heard about the plight of the daughters. Because he loved Jesus so much, he wanted to give as Jesus did; one night Nick secretly put a bag of gold in each of the daughters’ stockings that were hung out to dry. The next morning the family found the gold bags and the daughters were married and lived happily ever after. Since then, children have been hanging Christmas stockings. So how do we transform this to make it a reminder of the birth of Jesus Christ? 2 Corinthians 8:9 – For you know the grace of our Lord Jesus Christ, that though He was rich, yet for your sakes He became poor, that you through His poverty might become rich. Jesus left the riches of heaven in order to give His life on the Cross for us, so we can have the gift of abundant life. This is the greatest message of Christmas! Merry Christmas. We love yall.